We probably shouldn’t try to collect everything. We also should be collecting the “right” data. We should consider enhancing the data we collect to make it more valuable. Several suggested priorities are all online transaction detail and insight, most offline transaction detail and insight, social media data and insights and finally, call center transactions and insights. 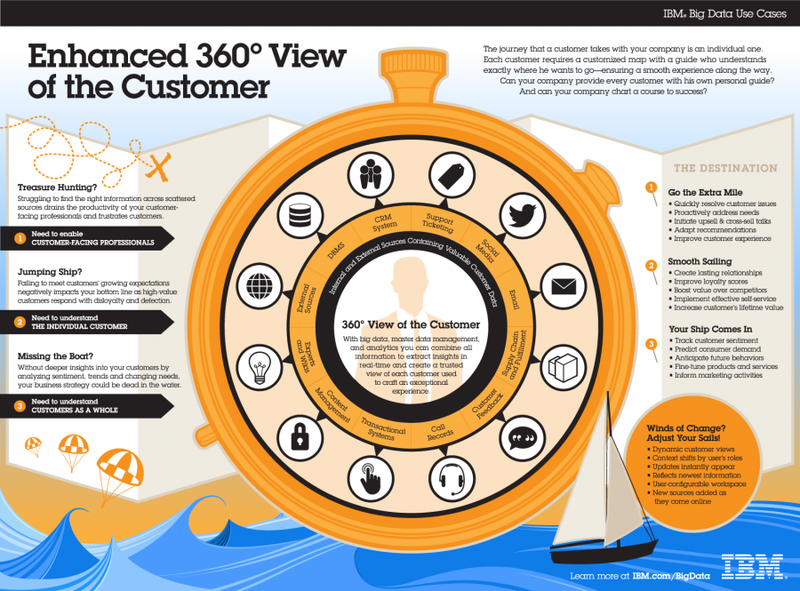 There has been a lot said and written about the 360 degree view of the customer. A quick Google search will bring up 13.7 million results. Many in favor and some questioning the strategy. I believe customer data is important. One thing to think about, however, is how much data do you need to know to make actionable decisions? Perhaps more than you have and perhaps less than you plan to gather which could be holding you back from acting today. Most of us have a ton of online data. It is easy to gather and relatively inexpensive to integrate. That said, many of us have no to very little offline data. Another gap can also be unstructured data. A core question is how important is a 360 degree view anyway? No human can see 360 degrees. Here is something interesting to think about. “To draw an analogy from the physical realm, out of 360 potential degrees, what’s our actual field of vision? Approximately a 120-degree arc. But even most of that is peripheral. In fact, when it comes to seeing in high resolution — say for reading purposes — our actual field of view is only about 6 degrees. In thinking about data integration, it will be helpful to suspend any discussion of what data can we integrate. Any data can be integrated. The real issue is what results you want for your business and what data do you need to improve the customer experience. From a planning point of view it is helpful to start with the end in mind and not the details of how we integrate everything. It is critical to know what data will give you actionable insight. Customers are using many channels to engage with your company. They expect a seamless experience across those channels. At a core level, that will involve collecting and integrating the data that customers expect to see across those channels. The important issue to think through is what does the customer expect you to know about what they have told on the mobile app and what you know about them when they make a purchase. It is all about the customer expectation. If you ask for information from a customer and they are willing to give it to you, then they probably expect that you will use it across channels to create a seamless experience. Customers also expect that you remember them. They get very upset when you don’t. They love you when you do. Know and remember is key to service. Do you need a deeper understanding of customer sentiment from both internal and external sources? Do you want to increase customer loyalty and satisfaction by understanding what meaningful actions are needed? Are you challenged to get the right information to the right people to provide customers what they need to solve problems, cross-sell, and up-sell? Start simple and don’t get carried away with all the possibilities. Begin creating a strategy now. Encourage collaboration and create a team to “oversee” your efforts. Commit to not collecting everything and be ok with that. Focus on key channels like online, offline checks / credit card transactions, and direct response. Create a data value framework to help set priorities. Pay attention to privacy and security. Your reputation is at stake.